If you're looking for something a little bit different from the conventional home flooring options, why not opt for polished concrete. Here are some of the reasons why polished concrete is a smart flooring choice in your home. Polished concrete is easy to clean and maintain - unlike many other materials. Its smooth surface doesn't absorb moisture, meaning that this material can last for many, many years (providing you with a great return on your investment). What's more, these driveways can withstand heavy footfall, making it the ideal choice for an office or workplace. Cleaning your polished concrete couldn't be more simple. Just use a broom or vacuum to keep it looking as good as it did the first day you installed it. Spills should be wiped up immediately, but are unlikely to stain even if left for longer periods. Polished floor surfaces have long been favoured by individuals who want a low maintenance solution for their properties; this material doesn't harbour any dust, grime, or dirt and is the preferred choice for people who don't have to time to clean the material on a regular basis. It's also perfect for those who experience allergies. Polished concrete has a smooth, shiny design that can be coloured to suit the interior of any house, office, or commercial building. Once used to decorate exterior spaces, this type of concrete is now becoming increasing popular inside, as seen on recent seasons of The Block tv show. It instantly catches the eye and looks like an incredibly premium finish. Many individuals compare polished concrete with granite or marble because of the high gloss coating that is used. However, unlike granite or marble, polished concrete is a lot more cost-effective. Don't forget, not only can you include coloured aggregate mixes, you can also apply a stain to the finish, to give you floor an even more unique look. 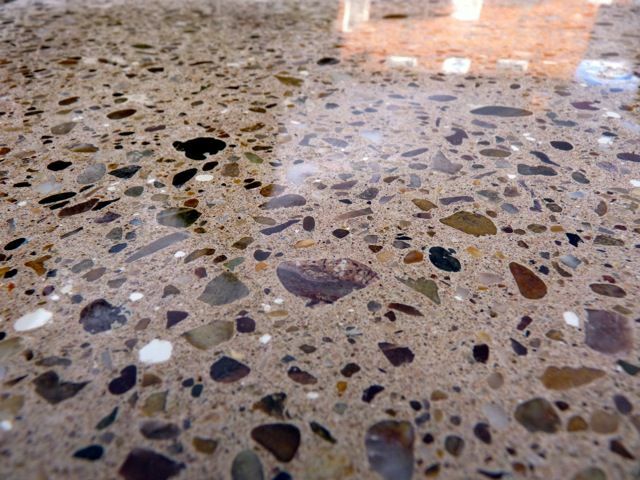 Interested in learning more about polished concrete? Why not speak to our expert Brad on 0419 518 760.